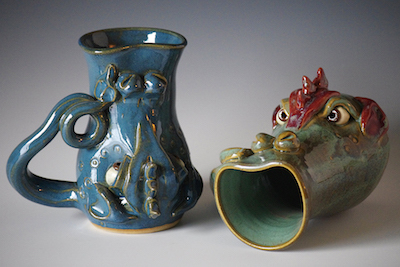 This unusual 18 oz., 6" mug is a dragon's head! You sip from his lip while he looks you in the eye! Available in blue, green, purple, or black glazes. All glazes are dishwasher and microwave safe and leadfree. The 14 oz., 6½" tall flagon with the dragon handle holds the brew that is true. 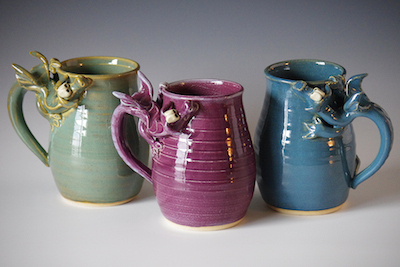 Available in the blue, green, purple, or black glazes. This unique 4" tall dragon can turn upside down to hold 1 oz. of your favorite beverage. Available in blue, green, purple, or black glazes. Tea Monster is 5" tall and holds about 12 oz. of liquid. After you're done brewing the tea, place the bag in his lower lip. Dishwasher and microwave safe, lead free. Shown in black, purple, and blue. Also available in green. 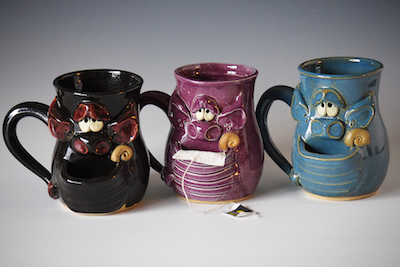 The 14 oz., 5" tall mug has a dragon inside with his paws on the inside wall looking up at you as you drink. 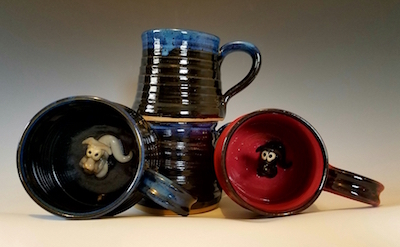 The 10 oz., 4" tall mug has a small dragon fired into the middle. This flagon is 5" tall and holds 16 oz. The dragon handle can be curved for right- OR left-handed use (please specify). Dishwasher and microwave safe, lead free. Shown in green, purple, and blue. Also available in black.